Idaho Republican Rep. Raul Labrador, who made headlines over the weekend for his comment at a town hall that "nobody" dies from a lack of health care, is running for Idaho governor. The fourth-term congressman filed paperwork Tuesday morning with Idaho's Secretary of State. Labrador, a conservative Republican and founding member of the House Freedom Caucus, faced immediate backlash over the weekend after claiming "nobody dies because they don't have access to health care" at a town hall in Idaho. Later, the Republican issued a statement to reporters acknowledging his answer "wasn't very elegant," but he was "responding to the false notion that the Republican health care plan will cause people to die in the streets, which I completely reject." Labrador has become known among the House Freedom Caucus as a member particularly unafraid to speak his mind. In March, was among the first to respond a tweet from President Donald Trump that the president would oppose House Freedom Caucus members in 2018 who had opposed his original health care plan. "Running for Governor of the great state of Idaho takes serious preparation," Labrador said in a statement provided to reporters. "To comply with both the spirit and the letter of the law, I have filed the appropriate campaign finance form required to register as a candidate for Governor. I'll be making a formal announcement in the coming weeks." "Idaho needs a proven conservative leader who will stand against the special interests and politicians that have picked the winners and losers in our state Capitol for too long," Labrador continued. "Idaho needs a strong leader who will make government fair for everyone. Idaho needs a governor who will provide a new vision, a new approach and new leadership." The House Oversight and Government Reform Committee member has strongly opposed Obamacare, higher government spending and federal takeover of land during his time in Congress. 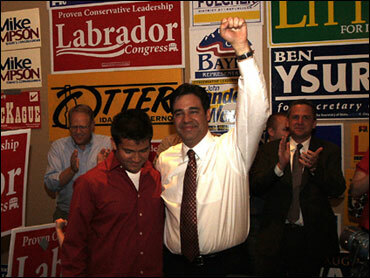 Labrador was first elected to the House of Representatives during the GOP midterm wave of 2010. Born in Puerto Rico, he received his law degree from the University of Washington School of Law. Labrador will have plenty of Republican competition. Idaho's Republican Lt. Gov. Brad Little, former Republican state Sen. Russ Fulcher and Boise businessman Tommy Ahlquist have all all announced their intention to run and succeed current GOP Gov. C.L. "Butch" Otter. Labrador isn't the only Republican announcing he will not run again in 2018. House Oversight and Government Reform Chairman Rep. Jason Chaffetz announced last month that he also will not run for another term in 2018.